Surveillance of Arthropod-borne Diseases in Military Facilities in Lao People’s Democratic Republic. 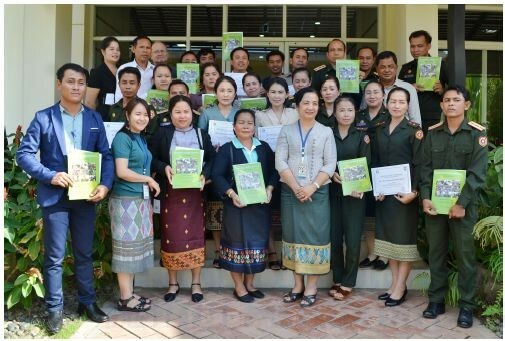 The main goal of Arboshield is to strengthen the capacity of the Lao Military and Civilian Medical Departments in the areas of vector-borne diseases surveillance, outbreak detection, and response. This three-year project initiated in November 2016, includes several components: a training curriculum, the support of arthropod-borne diseases surveillance in 7 military facilities, and the implementation of a quality assurance process. The training curriculum includes four modules: “Introduction of infectious diseases surveillance system” (delivered initially in November 2016), “Biosafety and biosecurity” (February 2017), “Introduction to arthropod-borne diseases” (May 2017), and “Taxonomy and systems for the identification of mosquitoes, ticks, and sandflies” (August 2017). A first group of 25 participants joined the course during the first year of Arboshield. The course has been replicated two times: in November 2017 and 2018, with two additional groups of trainees. The audience includes both civilians and militaries. Civilian participants are coming from Borkeo and Xayabouly provinces. Military participants are originating from the Military Academy, the Lao Army Institute for Disease Prevention, and from 6 military hospitals (Xieng Khouang, Luang Prabang, Vang Vieng, Savannakhet, Champasak and Vientiane municipality). During the third quarter 2017, laboratory equipment (centrifuge, autoclave and combined freezer-refrigerator) have been donated and installed in all hospitals sites. Rapid diagnostic tests (RDT) for dengue and malaria, personal protective equipment, and consumable for sample collection and transportation were additionally donated to the sites. Starting November 2017, the sites have started sending occasionally serum specimens to IPL for dengue PCR diagnostic. In August 2018, the hospital sites were requested to expand the scope of Arboshield surveillance to malaria, and to collect additional blood specimens on filter papers (to be shipped to IPL for PCR analysis using the dried blood technique ). Starting in February 2018, the IPL team has initiated on-site post-training assessments in the military sites. The objectives of these field visits were to: organize a refresher course with a focus on biosafety and biosecurity procedures, assess the local laboratory capacity, engage more actively the hospital teams in active surveillance, and proceed with the implementation of the quality assurance (QA) process. These visits allowed to develop a close relationship with the hospital teams, especially with the clinicians who were not the prime targets of the training workshops. Regarding the status of the equipment, several minor problems have been reported by the hospital sites, such as the breakage of the centrifuge covers in several hospitals, the failure of the autoclave in Vang Vieng (now repaired and reinstalled), and the sudden breakdown of the freezer in Champasak. The lack of an electrical “grid” in Lao PDR and the basic electrical installations within the military hospitals seems to be the main underlying cause. Laboratory personnel are currently using the equipment routinely for the purpose of vector-borne diseases surveillance. The staff is now well aware of the precautions and security procedures for specimen collection and transportation, and big efforts have been made, in all sites, to increase cleanliness, biosecurity, and biosafety. Aside from the supervisory visits, the QA also includes bi-monthly monitoring calls to the hospital Arboshield focal points, conducted by IPL project assistant. These calls are aimed at enhancing surveillance, early identification (and resolution) of problem encountered on sentinel sites, and close monitoring of the epidemiological situation and early outbreak detection. The implementation of the QA process had a significant, immediate, positive impact on Arboshield surveillance. The sites are now sending very regularly serum specimens for dengue and malaria PCR analyses. Additionally, the implementation of Arboshield activities resulted in the detection of an epidemic alert in Luang Prabang in July (with a follow-up field investigation conducted by the IPL team) with the technical support of the Lao-Mahosot-Welcome Research Unit (LOMWU).